Beta Gamma Sigma Website is the honor society serving business programs accredited by AACSB International. Membership in Beta Gamma Sigma is the highest recognition a business student anywhere in the world can receive in a business program accredited by AACSB International. Membership is always a welcome addition to a student’s resume. 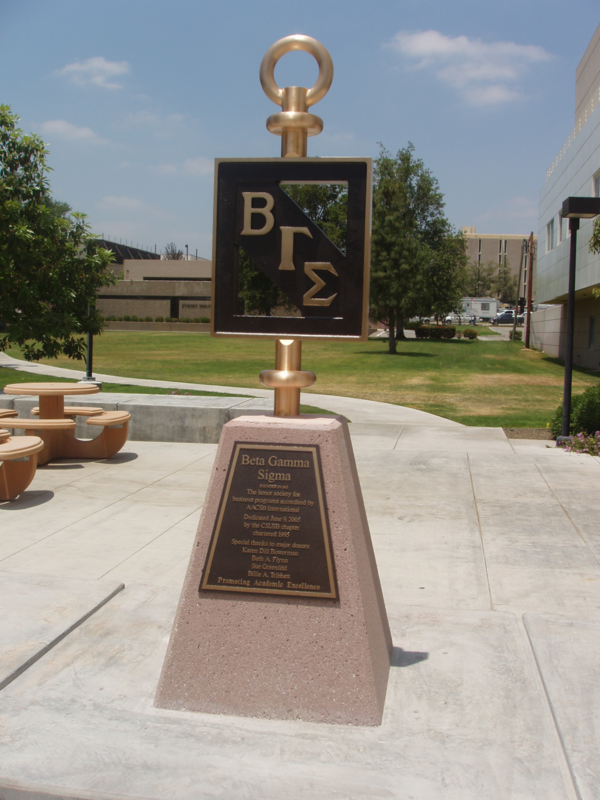 The CSUSB chapter of Beta Gamma Sigma was chartered in 1995. On our ten year anniversary a bronze alloy BGS Key Sculpture, the symbol of academic excellence, was dedicated in front of Jack Brown Hall by then President Albert Karnig. During the 2005-2006 academic year, CSUSB’s BGS chapter was the first CSU ever to be honored by Beta Gamma Sigma International as an Exemplary Chapter! We earned “Honors” from BGS Headquarters in 2017 and 2018! In the Jack H. Brown College of Business and Public Administration, only the top 10% of junior and senior business students and the top 20% of MBA, MSA and MSIST students are invited to join Beta Gamma Sigma! students are personally invited (or tapped) during the spring quarter annually. For a graduate student to be considered he/she must complete at least 50% of their graduate program’s 600-level units by the end of winter quarter and have a graduate GPA of approximately 3.8. Undergraduate business students need to complete at least 45 units here at CSUSB by the end of winter quarter and have a CSUSB GPA of approx. 3.6 or higher. Beta Gamma Sigma is recognized throughout the business world as the leading honor society for business and management education. Membership in the Society shows commitment to excellence as well as outstanding academic record. A recognition ceremony is usually held in June. Student’s receive a lifetime membership in BGS, a professional certificate (suitable for framing), honor cords and a fashionable BGS key pin to wear on your lapel.